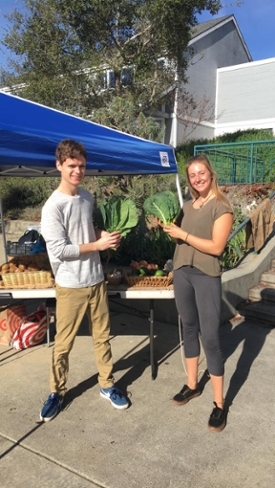 Twice weekly "pop-up" produce stands on campus offer fresh organic produce from the UCSC Farm and other local growers at low prices. Campus food pantries provide free food to UCSC students. The Basic Needs website includes a calendar of upcoming Basic Needs events, including CalFresh information sessions and campus resources fairs. When you’re worried about food and housing, it’s hard to concentrate on classwork. And with 4 in 10 UC students facing food insecurity due to steep increases in the cost of living, finding solutions to basic needs has become a focus of efforts at UC Santa Cruz. The newly launched UCSC Basic Needs website (basicneeds.ucsc.edu) brings together the many services, resources, and opportunities that address UCSC students’ food, housing, health, wellness, and financial security in one easy-to-access online hub. Developed by Nancy Yang, Food Access and Student Engagement Coordinator for the Center for Agroecology & Sustainable Food Systems (CASFS), the website’s goal is to make finding basic needs help easier for UCSC students by creating a one-stop-shop for resources. Yang teamed with members of the Food Access and Basic Needs Working Group and UCSC’s Slug Support Program in developing the site. “There are a lot of groups both on and off campus providing services to students facing food security, housing shortages, and other challenges,” says Yang, “but they are spread across various units, offices, and websites. We wanted to bring them into a single, accessible site that could be updated easily." The new website consolidates information on topics ranging from mental health and wellness services to food budgeting, and includes financial aid resources, renters’ information, and food pantry locations. For students looking to support and promote basic needs programs, there’s a list of internship and volunteer opportunities. Whether you need a little help with groceries, a short-term loan, or advice on how to stretch your food budget with healthy recipes, the Basic Needs website offers solutions. It highlights on-campus efforts such as the Slug Support program, CalFresh enrollment sessions, and the campus food pantries and organic pop-up produce stands, as well as off-campus food distributors and other services. Another goal for the site was to include interactive features that could be quickly updated. “For example, Sofia Vermuelen, the Basic Needs Communications Coordinator last fall, created an interactive Google map of on-campus microwave sites, off-campus retailers that accept EBT credit [also known as food stamps], and retailers that offer student meal deals,” says Yang. Yang notes that the website is in a “soft launch” phase. This spring, Basic Needs Communications Coordinator Kacy Khuu will maintain and update site content, as well as coordinate student feedback sessions to find out how to improve the website. The Basic Needs website is just one facet of an expanding effort to support students facing financial challenges and address the problem of food and housing security through UC's Global Food Initiative. 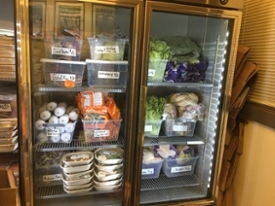 At UCSC, much of this work takes place through the UCSC Food Access & Basic Needs Working Group, co-chaired by Tim Galarneau of CASFS and Heather Bullock of the Psychology faculty. For more information, read about UC Santa Cruz and the UC Global Food Initiative. For more information about the new Basic Needs website, contact Nancy Yang at nyyang@ucsc.edu.